The Gunsmoke TV show was a western action series that aired on CBS for 30 minutes during its first six seasons and then expanded to 60 minutes. It emphasized a rare commodity in the wild west ... law and order! Marshall Matt Dillon was responsible for bringing respect for the law to Dodge City. Cattle thieves, gunfighters and other bad guys had to seek out another place to get into trouble! The wonderful theme song for the TV show was also titled "Gunsmoke" (also sometimes "Old Trail") and was written by Glenn Spencer and Rex Koury. John Wayne was offered the part of Matt Dillon but decided that movies were where he wanted to stay. He actually recommended James Arness to play Matt Dillon. (See Opening Narrative below). Before the TV show, there was a Gunsmoke radio show than aired from April 26, 1952 through June 18, 1961, co-existing with the Gunsmoke TV show for six seasons! The cast included William Conrad as Marshall Matt Dillon, Parley Baer as Chester, Howard McNear (Floyd the Barber on The Andy Griffith Show) as Doc, and Georgia Ellis as Kitty. The radio show's opening narrative was different than that of the TV show (See Below). It was narrated by Roy Rowan, George Walsh, and George Fenneman (Groucho Marx's sidekick on "You Bet Your Life") at different times during its run and went like this: "Around Dodge City and the territory out west there's just one way to handle all the killers and the spoilers, and that's with a US Marshal and the power of ... Gunsmoke!" William Conrad also had a narrative on each radio episode as follows: "I'm that man ... Matt Dillon, US Marshal. The first man they look for and the last they want to meet. It's a chancy job, but it makes a man watchful ... and a little lonely." While there had been other westerns before such as "The Lone Ranger" and "Annie Oakley", Gunsmoke was the first one oriented towards Adult audiences. Within a few years there were more than 30 such shows on the air at one time! Some favorites were "Bronco", "Have Gun Will Travel", "Maverick", "Rawhide", "The Rifleman", "Wagon Train", and "Wanted Dead or Alive". James Arness is the brother of Peter Graves (Jim Phelps on Mission Impossible). First Lady, "Lady Bird Johnson", was such a huge fan of the program that, when she learned that James Arness was a Republican, she felt personally betrayed! Gunsmoke was actually scheduled for cancellation in 1967 due to low rating. CBS President William Paley and his wife were big fans of the TV show, however, so he decided to try moving it from Saturday to Monday. It worked! The TV show got back into the top 10 rankings and stayed on the air 8 more years! It is often stated that Gunsmoke's 20 seasons on the air makes it the longest running American television series but that's not strictly true. Until the 2009/2010 season it was the longest running drama series on U.S. prime time television. At the end of that season it was tied for that distinction by "Law and Order". Other shows have been on the air longer but not in prime-time or they were news, variety, sports or talk shows. At this time (2010), "Meet the Press (1947)" is actually the longest running TV show on television with 62 continuous seasons! Second is "The Tonight Show" - 56 seasons. Others are "60 Minutes" - 42, "Monday Night Football" - 40, "The Wonderful World of Disney" (And Various Other Titles) - 36, "Saturday Night Live" - 35, "20/20" - 29, "The Ed Sullivan Show / "Toast of the Town") - 30 and "Late Show With David Letterman" - 29. Gunsmoke and Law and Order are only the longest running prime time Drama series. The longest running prime time series of all types as of the end of the 2010/2011 season was "The Simpsons" with 21 seasons. The name of Matt Dillon's horse was mentioned only one time throughout the entire Gunsmoke series by Festus Hagen when he called the horse, "Buck". Festus often called his own mule "Ruth". Many people have asked us who played the gunfighter that Matt Dillon shoots in the opening segment of Gunsmoke. The gunslinger was commonly referred to as "The Man in Black" and was portrayed by three actors. The first was Arvo Ojala, the second Fred McDougall and the third was Bill Strathman. At 6 feet 7 inches tall, James Arness was the tallest TV actor to play in a lead role. He weighed 235 pounds and had a 48 inch chest. Due to his large size, he was one of the first soldiers to storm the beaches at Anzio, Italy in world war II. Like many of those brave men, he was wounded. If Arness didn't always look huge onscreen, maybe it was because his co-star Dennis Weaver (Chester) was also tall at 6 feet 2 inches! Weaver was a vegetarian and environmentalist. His home was built almost exclusively from recycled building materials. In the 1948 Olympic trials, he won the 1500 meter run and got 6th place in the Decathlon! In 1958, he Amanda Blake (Kitty), and Milburn Stone (Doc) began singing together. In 1960 at the New Mexico State Fair, their performance broke the attendance record at the Albuquerque Arena! He refused to wear a leg brace as a prop on Gunsmoke as he feared being seriously injured while riding a horse. His trademark "limp" seemed to do just fine on its own! Dennis Weaver, in fact, was the one who came up with the idea of his character having a bad leg. He felt that would help Chester stand out a bit from the magnificent presence that James Arness had on the screen. Weaver might not have even gotten the role if not for another brilliant move! When he auditioned for the part, things didn't seem to go real well the first time through. He asked if he could redo the audition and then used that comical, "good ole country boy" accent that we all know so well, and he got hired! Ken Curtis (Festus) started as a singer for Tommy Dorsey's orchestra! That led to several roles in "singing cowboy" movies which were popular in the late 1940s. He appeared in many of Director John Ford's movies after that (he married Ford's daughter) before landing his role on this program. "Good evening. My name's Wayne. Some of you may have seen me before. I hope so-I've been kickin' around Hollywood for a long time. I've made a lot of pictures out here, all kinds. Some of 'em have been Westerns, and that's what I'm here to tell you about tonight-a Western. A new television show called Gunsmoke. 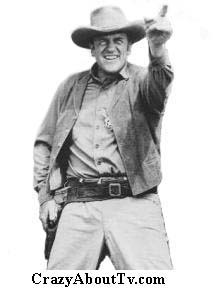 When I first heard about the show Gunsmoke, I knew there was only one man to play in it-James Arness. He's a young fella, and maybe new to some of you, but I've worked with him, and I predict he'll be a big star. And now I'm proud to present Gunsmoke." "On Saturday night in Dodge City, too many men think they'll find courage at the bottom of a whiskey bottle. I know, because I'm the United States Marshal Matt Dillon." Thank you for visiting our Gunsmoke TV Show page!